Pamela Hinckley is surrounded by bakers and pastry makers who are shaping thin loaves of ficelle, seasoning homemade croutons and shaping pie crusts and pizza dough. From her spot on the production floor of the Dahlia Workshop, the CEO of Tom Douglas Restaurants (TDR) gestures to the second level, where pizzas are being served at Serious Pie. Guests sitting at long communal tables have a full perspective on the action below and a view into the wine shop and the new Dahlia Workshop Biscuit Bar, which occupy the front of the building’s first floor. Serious Pie Westlake, which opened in February and seats 49 patrons, is one of five new South Lake Union restaurants celebrated chef Tom Douglas is opening this year, a move that doubles the size of his restaurant empire to 10—not counting bakeries—in a mere three months. Only Serious Pie is a repeat; the others are new concepts. Giving customers a peek into the kitchen to see the chef’s magic has been a hallmark of Tom Douglas establishments, but the company is elevating the practice at the new restaurants as an important marketing strategy—to show customers how much effort goes into preparing food from scratch. At Ting Momo, 10-year Tom Douglas veteran Deyki Thonden, a Tibetan chef who cooks for the Dalai Lama when he comes to North America, is the star attraction. She makes her famous dumplings in an open cooking station similar to Cuoco’s, so all can watch. And just a dumpling’s toss away, guests at the Brave Horse Tavern can see pretzels baking in what Douglas says may be the first wood-fired pretzel oven in the country. Ting Momo, Cuoco and Brave Horse Tavern occupy the historic Terry Building, with the 100-seat Cuoco on the first floor and Brave Horse (120 seats) and Ting Momo (25 seats) sharing the second. The three are a block away from the building housing Serious Pie and Dahlia Workshop Biscuit Bar, as well as Soul Wine, which is run by Hinckley’s husband, Michael Teer. While customer demand inspired Douglas to open a second Serious Pie on his foray into South Lake Union, he was loath to duplicate his other successes: Dahlia Lounge, Etta’s Seafood, Palace Kitchen, Lola and, his most recent endeavor, Seatown Seabar & Rotisserie. “Why do something twice?” asks Douglas, who says he has a never-ending supply of restaurant ideas. Still, he didn’t actually plan to add five new restaurants so quickly, but when Vulcan Inc. came knocking with several options and the carrot of 10,000 Amazon.com employees in the neighborhood as potential customers, Douglas couldn’t turn down the opportunities. The expansion means 200 additional employees are joining TDR’s existing staff of 550. Revenues for the reconfigured company in 2011 are projected to be $35 million. Douglas started positioning the company for growth two years ago when he hired Hinckley. The two are longtime friends—Hinckley is godmother to Douglas and Jackie Cross’s daughter, Loretta (namesake of Etta’s Seafood)—but Douglas wasn’t really looking for help or to expand so rapidly. Hinckley had just left Theo Chocolate as head of marketing and asked Douglas for help with her résumé. Douglas says, “I was struggling as we were growing bigger and felt we needed a different skill set [to get to the next level]. So I wrote up a job description for TDR and asked her to consider it.” Hinckley hesitated at first because she valued a close friendship. Years ago, Jackie Cross worked for Hinckley’s husband at the Pike & Western Wine Shop, where Douglas was an occasional driver for its wine distribution business. Douglas later worked for Hinckley, pouring beer at Redhook Brewery’s Fremont tavern to earn money to open his first restaurant, Dahlia Lounge. “I still remember when Tom catered the Woodinville [Redhook] brewery opening,” Hinckley says. “He did the catering and delivered the food by cab—by himself.” While at Theo, Hinckley brought in Douglas and others as investors, and when she had her own marketing firm, she helped Douglas with his marketing efforts. Hinckley joined the company in 2009 and immersed herself in the business that first year, soaking up the nuances of the different restaurants and learning how each operates. Douglas knew he couldn’t be at each restaurant every day and make all the decisions, and he wanted structural help to ensure each restaurant carried out and executed his vision. After studying the business, Hinckley and Douglas decided to give every restaurant more autonomy and an identity based upon what the team in each restaurant wanted to accomplish. “We’re always thinking about positioning and branding between Tom and restaurants, and although they are all linked, we wanted each general manger and chef to be visible in that organization and make the decisions about it,” Hinckley says. TDR executive chef Eric Tanaka, who oversees menu development and purchasing, has a bigger voice as part of the changes. With his input, the company stepped up its education efforts, taking more field trips and making written materials more available. One well-known operational practice hasn’t changed: TDR’s 75-plus managers continue to dine out at least once a month on the company’s dime at any Tom Douglas restaurant of their choice. In return, they are required to fill out a detailed questionnaire, giving feedback and suggestions. Douglas, who has always homegrown his own chefs, has also continued the practice of shifting chefs and general managers around every so often in the organization, which allows them to gain experience at various levels. 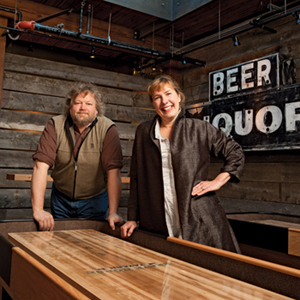 The new openings in South Lake Union mark some milestones. The Terry Building restaurants are the first to be built with help from an architect and builder. Previously, Douglas and Cross did the work with a small crew. And Cuoco’s chef, Stuart Lane, is the first to be hired from outside the organization. The company has added more programs at its Palace Ballroom event space, it hosts a Wine Press Club and it launched a family cooking series on Sundays. It has partnered with Kim Ricketts Book Events to host authors, sponsored Keren Brown’s Foodportunity networking events and created events around holidays and specific foods, such as Baconopolis. Tom Douglas Restaurants projects revenues of $35 million in 2011 and expects total employment to reach 750. CEO Pamela Hinckley’s job is to supervise this ever-expanding menu.